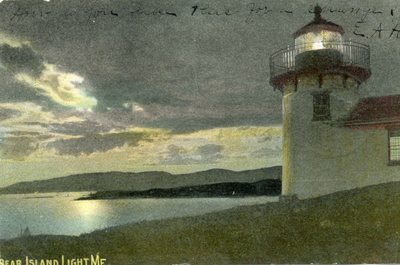 "Bear Island, Maine, Bear Island Light "
An image scanned from a color postcard depicting the Bear Island Light House on Bear Island, Maine. Undated. Bear Island Light sits on the west end of the island. It was built in 1889 and manned until 1981. The lighthouse is now a private aid to navigation and a private residence.